As Aaron Rodgers tossed five touchdown passes in a win over the Chicago Bears on Sunday night, NBC commentator Chris Collinsworth repeatedly referred to the Green Bay quarterback as the NFL MVP. While that vote hasn't happened yet, Collinsworth isn't the only person who considers it a foregone conclusion that Rodgers will win it. Still, how is Drew Brees, the quarterback who has thrown for more yards in a season than any other in NFL history, basically an afterthought in the discussion? In reality, this should be one of the closest MVP votes ever. Comparing the numbers is like splitting hairs. Brees has 444 more yards, while Rodgers has more touchdowns (45 to 41) and fewer interceptions (6 to 13). Some have made the case that Rodgers means more to his team, particularly in a year in which the Packers were chasing perfection until a loss to the Kansas City Chiefs. Obviously, he's the heart and soul of Green Bay. However, Brees is just as important to the Saints. Without him, they don't win the NFC South, nor do they make the playoffs. Also, had Brees' record come during an overall sub-par season for the team, it would be easier to dismiss. But New Orleans is currently 12-3, and look primed for another Super Bowl run. They'll likely have to go through Wisconsin in order to get there, and everyone knows that's a tough place to play in January. Although, Monday's 45-16 dismantling of the Atlanta Falcons showed that the Saints are perfectly capable of going to Lambeau Field and getting the job done. So, Aaron Rodgers or Drew Brees? Who is really the league's Most Valuable Player? I have a logical solution to this dilemma. A split title. It's happened before. In 1997 with Brett Favre and Barry Sanders, and in 2003 with Peyton Manning and Steve McNair. If ever it needed to happen again, it's this year, because there's no doubt Brees deserves his cut of the award. Disagree. Brees plays over half his games in a dome stadium. 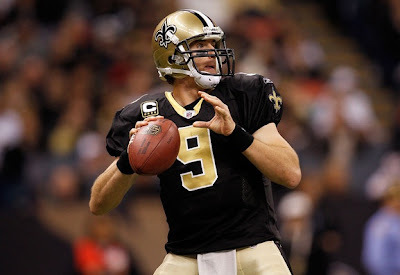 Not having to deal with the elements all season long like Aaron Rodgers or Tom Brady do is a huge advantage for Brees. He's had a good season, but he's not MVP worthy. I think he deserves a share of it as well. He shouldn't be punished because he plays indoors a lot. Still had a monster season. Right up there with what Rodgers has done. Brees has been awesome. While I do think Rodgers should win it, I wouldn't have a problem with there being co-MVP's at all. Both guys have played great football all season long. Wait, an NFL MVP post by Kris and not a SINGLE MENTION of Tom Brady in it? I'm in shock. You're still wrong though. Rodgers should be MVP hands down. Dude, Brees' rating is 14 points lower than Rodgers, and he's also thrown twice as many interceptions. NO WAY they should be co-MVPs. How about Brees for Offensive Player of the Year, and Rodgers for MVP? That way they both get something.